Super Bowl Sunday is 2 days away! The Patriots are in it, yes! I'm looking forward to a great game & great commercials! This is a Sunday afternoon/ evening when a yummy easy to make dinner works well. Yes, there's the option of ordering "take- out", but that is not really necessary. Take a look at my snowflake "Word Cloud"! You know those interesting designs that are filled with words. You see them in magazines & advertising. I filled my Word Cloud with easy to make recipes. If you move your cursor over the name of any recipe, it gets larger. Click on the recipe & you'll see my blog post containing the recipe. There are many choices of very tasty dinners! Some are for Slow Cookers/ Crock Pots! Choose your fave to make on Sunday. Put the ingredients on your grocery list! Cooking with no fuss before the Super Bowl! What will you be cooking??? Walking past any window in our home brings a beautiful view today! We were very lucky that we did not get the total snowfall that was predicted nor the snowfall that central & eastern MA got. There will be snow flurries adding to the 6.5" that was measured in our driveway from this storm. The welcoming sound of snow blowers can be heard. My DH & our neighbors are all outside working. Driveways, sidewalks & paths to our storage sheds will be cleared & we will be ready for the next snowfall. In a few months our outdoor grill will be used, again. It's covered & hidden in the above photo! 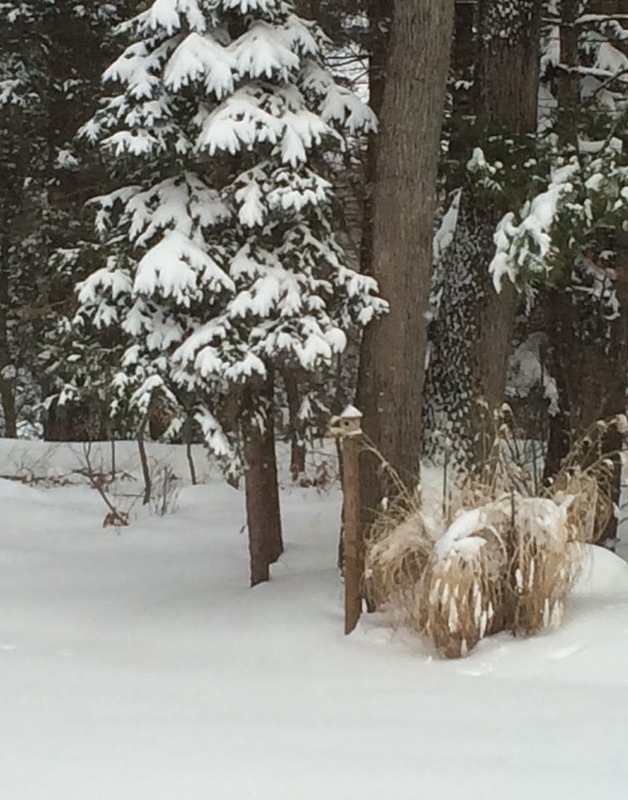 It is winter in New England! Many times I've shared my dislike for the taste of bananas. However, along with my lack of preferring that fruit, I also know that Potassium is an important mineral that's needed in our daily diets! The reality is that Bananas are a great source & bananas can be purchased easily. O.K., I get it! For that reason a bunch of that particular fruit is purchased weekly, sometimes twice per week. Usually, banana slices are added to my yogurt at lunchtime. Or slices of an overripe banana are added to Cream of Wheat cereal while it's cooking (directions) on the stove. 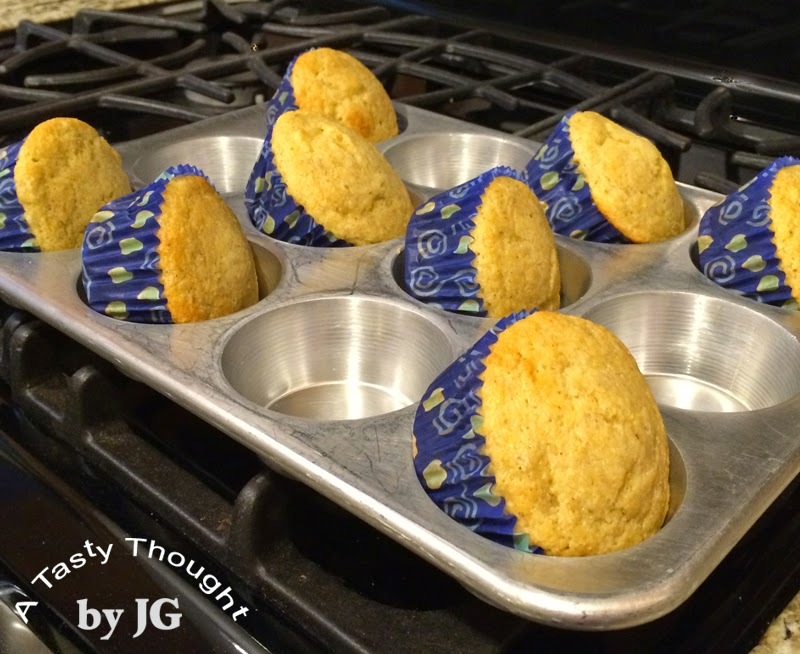 Usually, a box of "JIFFY" corn muffin mix can be found in my pantry. For me- it's a "comfort food". My mom always made these muffins. The other day both the boxed mix & an overripe banana were available. We enjoy Banana Cornmeal Pancakes, so why not make muffins? I did! What a great combo - Banana Cornmeal Muffins! 8 golden Banana Cornmeal Muffins were baked! So tasty! 4 of these yummy muffins were placed in our freezer for another morning. It's taken years, but I seem to be enjoying the taste of that particular fruit! Never knew I'd say that! WoW! The terms "Winter Storm Warning" & "crippling snowstorm" have been broadcasted numerous times today describing the beginning of this week! 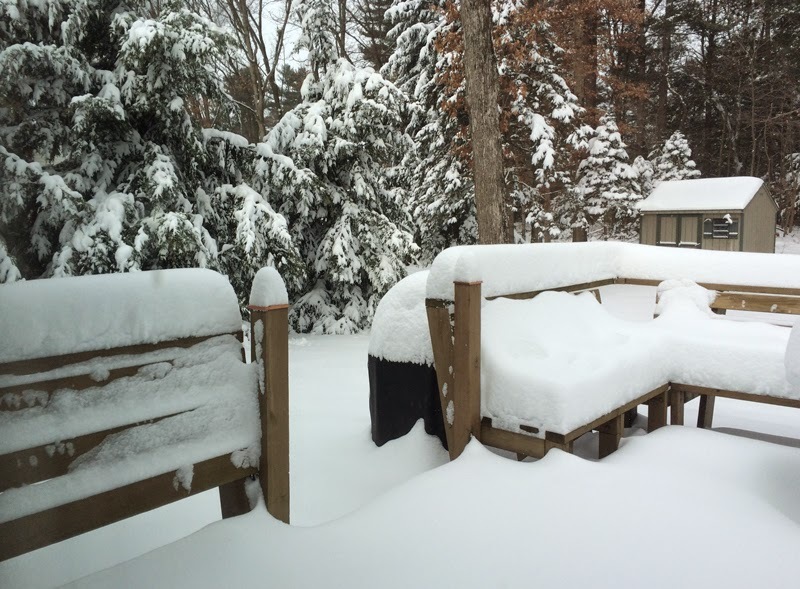 Our fridge & our pantry are full & our snow blower is "good to go"! It will be interesting here in the Northeast! The Banana Cornmeal Muffins (that are in our freezer) will be yummy tomorrow! Do you enjoy learning a little history? I do. Reading interesting historical facts about the state that I live in is fascinating to me. We all think about Massachusetts on Thanksgiving Day & also when we read about the founding fathers of our country. The cranberry bogs on the Cape (Cape Cod) & Dr. Seuss (born in Springfield, MA) along with the Basketball Hall of Fame (Springfield, MA) all have connections to Massachusetts. Oh, there is so much more! If you enjoy small doses of history at a time there's a great website that publishes a short story every day. The website's name is Mass Moments. Yes, Mass Moments publishes history facts about Massachusetts. Every day the featured fact is an event that took place on the same date & month that you are reading it, but the event took place in a previous year! Some are hundreds of years ago. What a great way to learn a little history! "Indian Boys arrive in Longmeadow" took place on January 23, 1800. This story is definitely interesting to me! The raid on Deerfield, MA in 1704. Stephen Williams & his family! Colonial history! Scrolling down to the credits I recognized the name John Demos. (The Unredeemed Captive: A Family Story from Early America, by John Demos) I had the privilege of listening to his fascinating lecture at the Longmeadow Historical Society's annual meeting this past October. Mass Moments is a great site with snippets of Massachusetts history- every day. If you enjoy reading history, click on this site! It's great! 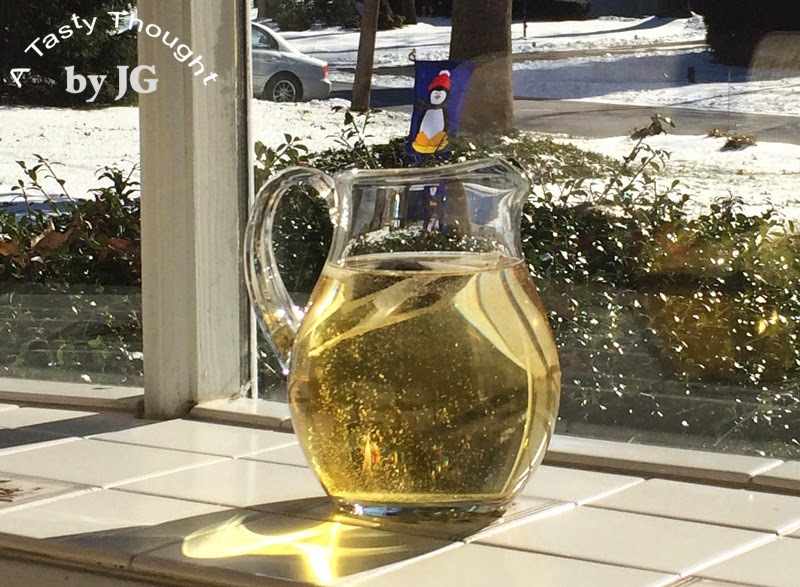 Even during the colder months with snow on the ground and our Penguin garden flag is up, Solar Green Tea is brewing on my window sill! Our home faces south & the southerly exposure works very well to brew my tea. Only my pitcher knows how many times it has been in this location filled with cold water & 3 Decaf Green Tea Bags. About 3 & 1/2 hours later the tea bags are removed. Any time of year it's great to open my fridge & find the covered pitcher containing cold Green Tea. During the winter it's easy to forget to drink enough fluids. This beverage tastes so good! Oh, it sure is frigid outside! It's the time of year when our treadmill & I bond! Well, this time of year & also when we have a heat wave during the HHH weather. It's also the time of year when a bowl of steaming hearty Beef Stew tastes so good. 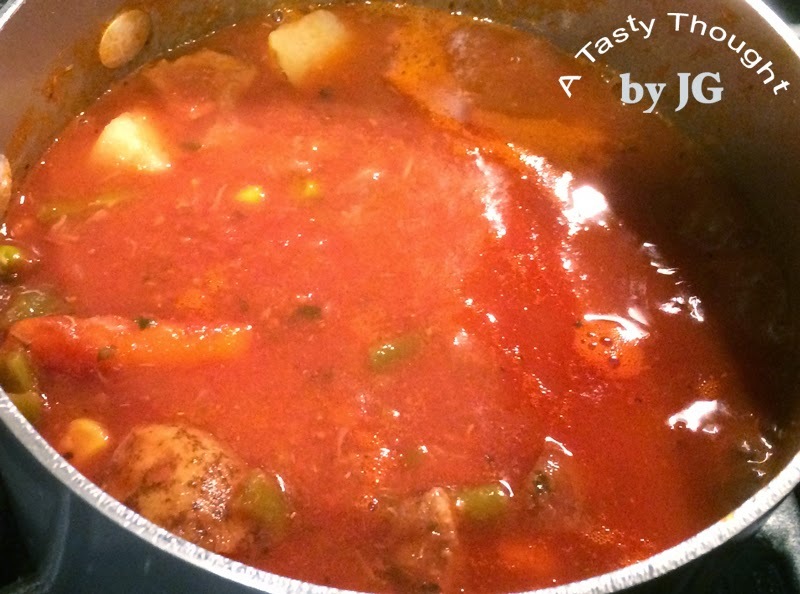 Beef Stew is one of those easy prep meals for my Slow Cooker. Everything goes in the Slow Cooker's pot & a few hours later a scrumptious healthy colorful dinner is ready- without much fuss. My Slow Cooker's cooking pot has a nonstick coating, but I always spray the cooking pot with PAM. Then, Carrots are placed on the bottom with the cut up chunks of Beef placed on top. This tasty easy dinner is always enjoyed the first evening & any extra portions can be placed in the freezer. After the stew has cooled, individual portions are packaged in Ziploc Freezer Containers, labelled & frozen for a "take out" meal after a busy day when there's no time to cook dinner! It can be defrosted/ reheated in a sauce pot along with about 4- 6 ounces of water. Defrosting overnight in the fridge works great, also! Rinse about 1 lb. Beef Stewing Meat under cold water. Cut in chunks and place on Carrots. Add (1) 16 oz. pkg. defrosted Mixed Veggies on top. Sprinkle on Oregano and Basil. Wash (1) Potato and cut into small chunks. Add on top. **Sometimes I add 2 Bay Leaves before adding the Tomato Sauce. The weekend is a great time to use your Slow Cooker/ Crock Pot to prepare Beef Stew! Have you tried it yet? Tastes so good on a chilly day. Perfect for tonight, it's snowing!